This family quote, “a little paint, a little paneling,” originated with my dad. He probably learned it from his mother, perhaps. I just did a Google search on that quote and believe it or not, the only two entries that reference it are on this blog! 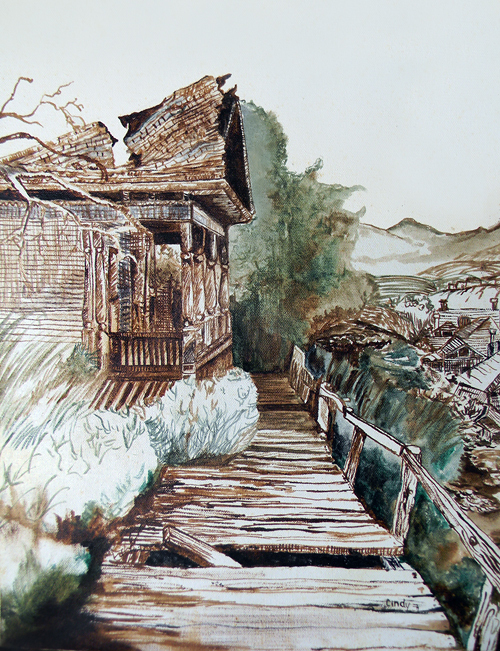 On family vacations, when we would invariably pass by a dilapidated house or barn, held up with just a few boards and rusty nails, and showing sky through the roof, my dad would point at the structure and quip, “a little paint, a little paneling,” as if that was all it would take to make the hovel presentable. I still use that quote today and since we can safely assume my dad invented the phrase, I will give you permission to use it as needed. Just remember who invented it and give credit where credit is due. Or, you could make a donation through PayPal to the King of Texas each time you use it. The King says a quarter per use (he acknowledges it is a tough economy for his subjects) would be greatly appreciated. Donations would help with the upkeep of the castle (he is retired and on a fixed income, you know). It would certainly be appropriate with this sketchy painting done in thinned-out oil paints on an 11×16 canvas. I’m not sure what I was referencing when I painted it—it could have been an exact copy of a painting or even sketched from a photograph in a magazine. I’ve always liked loosely painted subjects and that’s the style I tend to lean toward now when I do paint. 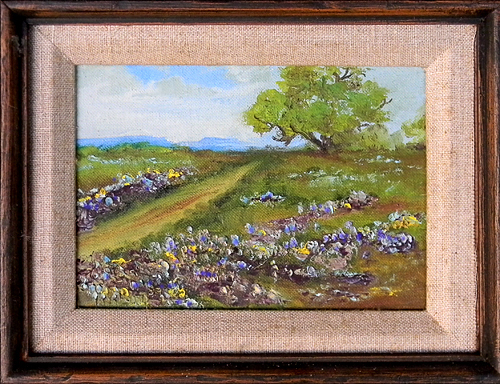 This tiny painting measures just 4×6″ and is an original oil painting that I did when I was about 17 years old. Brian Loflin, a professional photographer living in Austin, Texas, was my boss umpteen years ago (I shant say how many lest I reveal my agedness) and is my photography mentor and lifelong friend. I met him when he was doing a fashion photo shoot for Jones & Jones, an upscale department store at La Plaza Mall in McAllen, Texas. This was one of my first jobs out of college and I was hired to do fashion illustration and write newspaper and ad copy. I was asked to assist Brian and since I had a yen for photography, I relished the chance to do so. Not long after, he offered me a full-time position, and despite the long commute, I accepted without hesitation. I worked with Brian on myriad advertising and marketing projects and acquired so many skills in the year I was employed as both a graphic designer and photography assistant at his studio, Loflin & Associates, in Brownsville, Texas. I drove from my tiny hometown of Donna, Texas five days a week to Brownsville to work. It was approximately 60 miles each way, so that was a roughly two-hour commute, as traffic wasn’t heavy in that area. If I had to commute 60 miles in the D.C. area, it would take me well over two hours each way, I’m certain. I didn’t mind the commute (especially after my dad offered me his bright orange diesel VW Rabbit to lessen the cost). Under Brian’s watchful eyes, I became very proficient at b&w film developing and printing, learned a lot about studio lighting for both products and people, went stark crazy learning how to spec type for brochures (this was covered wagon days, well before Jobs and Wozniak offered us Apple and desktop publishing), and accompanied him on unusual photography excursions such as the workings of an aloe vera plant from the field to the final product (fascinating!) and the christening and photo inventory of the world’s largest offshore drilling rig (exhilarating!). In this recent posting on his natural science photography blog, he offers a brief lesson in composition. Enjoy! 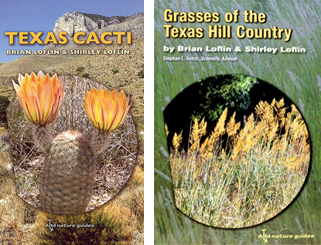 Brian and his wife, Shirley, have published three books: Texas Cacti: A Field Guide and Grasses of the Texas Hill Country: A Field Guide, both published by Texas A&M University Press. Their latest book, Texas Wildflower Vistas and Hidden Treasures, will be hot off the press shortly. Their Grasses book recently received the Carroll Abbott Award from the Native Plant Society of Texas. This was a 24×36 oil painting that I copied from a small postcard in Lila’s “morgue file.” (I don’t remember the original artist’s name.) I was immediately drawn to it because of all the blues and greens. It was a monumental undertaking because of all the details and all the color mixing. I most certainly didn’t complete this one in two Saturday sessions! 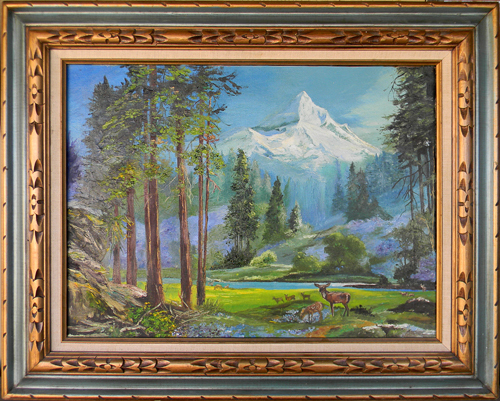 I was so tired of it at the end that my father tried to bribe me with money to finish the deer in the background with more details. I had completed the one on the far right and was so exhausted that I just painted brown amorphous shapes in for the others! (Maybe one day I’ll surprise him and finish it. Hmph.) He just told me that this was yet another painting that Lila advised me against attempting. Well, except for not finishing the deer, I showed her, huh? Here’s one of my favorite oil paintings. I don’t recall the artist who did the original. I was probably 15 or 16 when I painted it. This is an 18×24 canvas. 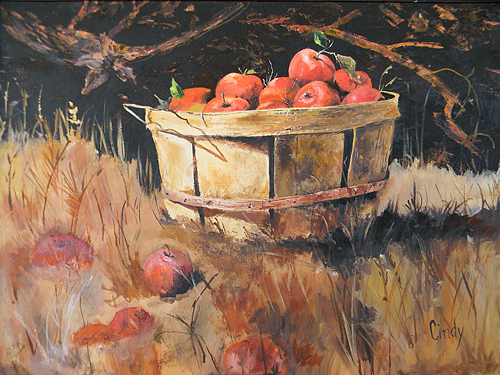 Here’s another painting I copied while studying with Lila Prater in Weslaco, Texas. I was about 15 when I painted this 18×24 canvas. I did this 8×10 painting for my father when I was about 15 years old. 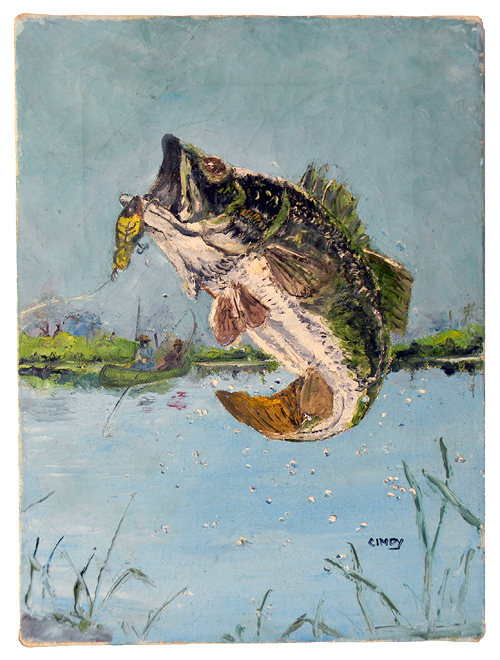 I think I copied it from an original illustration in a fishing magazine. 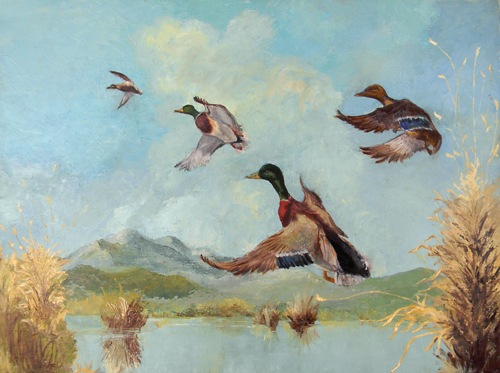 This was one of the unframed paintings in my dad’s frame shop (guess he didn’t like it enough to frame it, huh?) The canvas is cracked (cheap student paint supplies, perhaps?) but that gives it a cool old-world feel now! Note: It’s funny how I signed my name in a different way and location on every painting. I have put it one of the following positions: right side at the bottom, nestled by an object like a vase in a still life, all caps and first and last name written, all caps and just first name written, or just my first name with an initial cap. I also only dated a few of them. What consistency, huh?